NYCC Guest Week is in full effect! 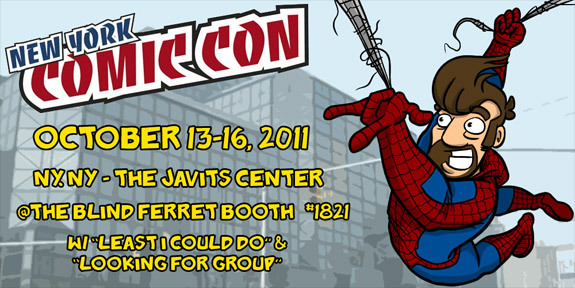 I am at New York Comic-Con with Blind Ferret at Booth #1821 this weekend (10-13 to 10-16). I will trade awkward stares for confusing winks and t-shirts, sketches, prints and books for stacks and stacks of monies. I will be giving out free “Sci-Fives” all weekend [the hand gesture, not the t-shirt]. Sam Logan of Sam and Fuzzy understands my struggle. It isn’t enough to just juxtapose two elements of pop culture and wait for the delicious LOLs to roll in. You have to find a reason WHY the juxtaposition is funny. The equation must have a result other than “I know both’o thems things.” It’s not enough to say, “What if Batman was in Starfleet?” Because he would… wait… what IF Batman WAS in Starfleet?! I… I have have to go start a new comic. Sam Logan has the unique distinction of being one of the 4 or 5 Canadians I know. 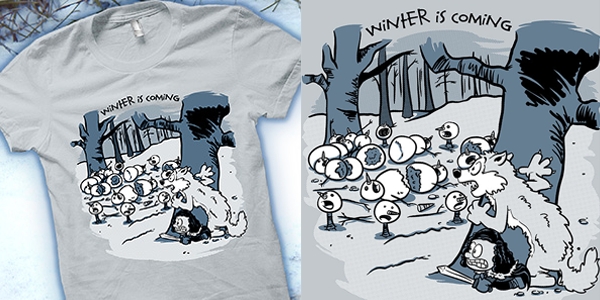 He also makes essentially the best Harry Potter T-shirt the word has ever seen, and draws caves like nobody’s business. Not to mention he is one of my favorite convention buddies in all of comicdom. 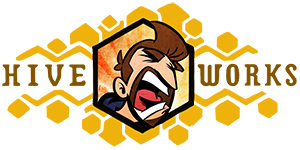 I take immense pleasure in improving his merchandise, and helping his create horrifying characters [scroll down to the blog post] and t-shirts that no one would ever want. COMMENTERS: Following Sam’s example, come up with your own terrible pop-culture mashup. Puns are encouraged. Actually being funny for the right reasons is not. 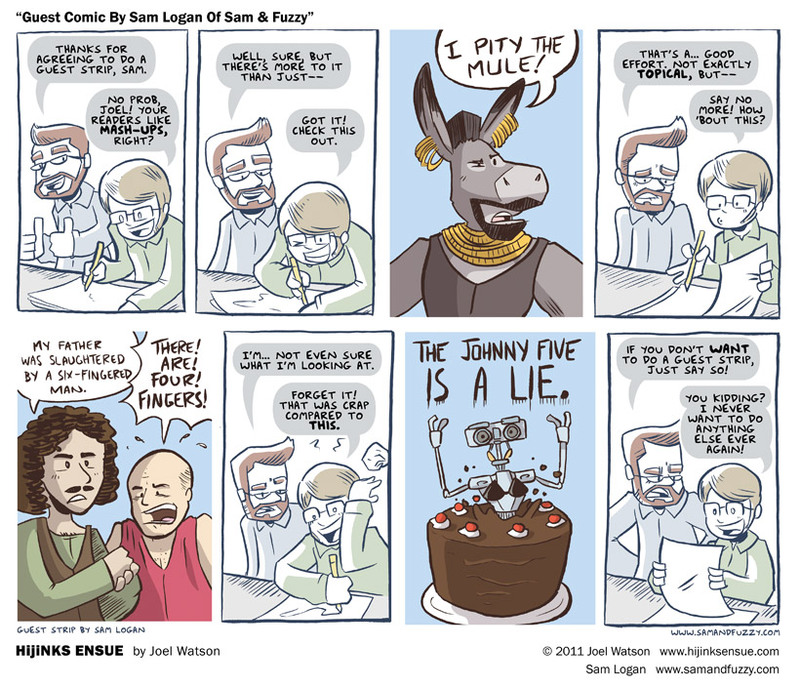 Posted in Uncategorized and tagged hijinks ensue guest comic, mr. t, sam and fuzzy, sam logan, short circuit, star trek, The Princess Bride. If you're going to do something with Mr. T, make it political… "The Mister T. Party"
How about that old '70s Star Wars hit "Clones to the left of me, JarJar to the right, here I am, stuck in the prequels with you…"
A story of retired Doctor Who companions… "On Golden Amy Pond"
someone please make a Cthulhuis C.K. anything. Love the obscure Star Trek:TNG reference. I love Sam and Fuzzy, and I absolutely loved this guest strip. He definitely nailed the obscure reference requirement for an HE strip. Maybe you guys should just swap strips for a month and watch the wacky [Pun redacted]! Best. Guest. Comic. EVAR! S&F has a new subscriber! A group of rednecks goes out drinking one night and one of them is abducted by Malcolm Reynolds and his crew: Fire in the Fly. A large group of contestants vie for the grand prize by angling for various objects in a Jacuzzi and casting them to their partner. Broadcast just before the evening news – Whose line is this anyways? Am I the only one who wants "I pity the mule" on a t-shirt? I don't know exactly how I got off on this tangent, but DC vs. Wizard of Oz. Either Cheetah or Hyena (http://en.wikipedia.org/wiki/Hyena_%28comics%29) as the Cowardly Lion. The Good Zatanna of the North,. I feel like the Wizard would be either Lex Luthor or Brainiac. Am I thinking too much about these? "You lie! On the 10 PM time slot there was life, a fair chance to…"
"This is the 10 PM time slot! The ratings tanked three weeks after we were left here. The shock destroyed all the advertisers and everything was laid waste." "We're all with you, sir, but consider: we are free, we have the means to go to any network you wish, ABC, Fox, or even cable. We have escaped exile on prime time. You have proved your superior intellect and defeated the plans of Admiral CoCo. You need not defeat him again." "He tasks me — and I'll have the Tonight Show back. I'll chase him round the moons of Nibia and round the Antares maelstrom and round perdition's flames before I give him up." If we're going to talk about crazy comparisons, then i need to explain how Star Trek: Voyager is basically the plot of the British sci fi comedy series "Red Dwarf" (which started airing in 1988). Red Dwarf is the story of a ship that ends up a gigantic distance away from Earth, and even though it seems hopeless, they try to get back to Earth anyway. and in season 3, they are joined by an android (cf Seven of Nine, who first appeared on Voyager in the cliffhanger on season 3). Sorry…the only mash-up my brain can currently come up with is Doctor Who and Firefly, and that's just because I keep thinking of a Double Doctor Captain Sandwich. "River Tam has left Serenity. River Tam has been saved. River Tam has left Serenity. River Tam has been saved." OMG How could I forget the mash-up of River Tam Song?